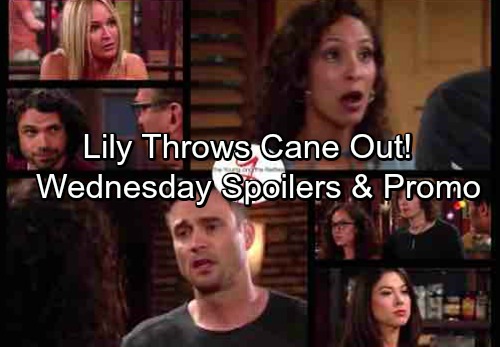 The Young and the Restless (Y&R) spoilers for Wednesday, August 2, tease that Lily (Christel Khalil) will get updates on the rest of Cane’s (Daniel Goddard) awful actions. Once she learns Cane tanked the commercial by targeting Billy (Jason Thompson), Lily will urge him to tell her that’s not true. When he can’t, Lily will make a bold declaration. She’ll insist that she wants Cane out of the house tonight. A crushed Cane will argue that Lily doesn’t mean that. He’ll hope he can get her to calm down, but his efforts will fail miserably. Lily will tell Cane to pack his bags and leave as soon as possible. She’ll barely be able to look at Cane after everything he’s done. It sounds like Lily is giving up on their marriage – at least for now. Meanwhile, Sharon (Sharon Case) will be on a mission to find Crystal (Morgan Obenreder) before it’s too late. Nick (Joshua Morrow) recently spotted this troubled young woman in an alley near The Underground. Sharon vows to protect her in Tuesday’s Y&R episode, but Crystal takes off again. On Wednesday, Sharon will be even more determined to locate Crystal and get her the help she needs. The Young and the Restless spoilers say Sharon will fill Paul (Doug Davidson) in on their encounter. She’ll explain that Crystal ran away, but she’ll refuse to give up. Sharon will beg Paul to help her find Crystal tonight and get her out of this mess. She’ll worry that time is running out for this distressed girl. Elsewhere, Charlie (Noah Alexander Gerry) will run into Juliet (Laur Allen) once more. He had no idea who he was talking to during their last conversation, but that’s about to change. Reed (Tristan Lake Leabu) and Mattie (Lexie Stevenson) will be on hand to tell Charlie who this woman really is. The Young and the Restless spoilers say Juliet will stand there as Reed reveals what happened to Victoria (Amelia Heinle). He’ll note that Juliet sued his mom’s company. Mattie will add that Juliet is the one their Dad got pregnant. Charlie should see red, but Juliet will probably continue her sneaky tactics. She might think she can manipulate Charlie and swing things in her favor with Cane. Regardless, you can bet that some great drama is brewing. We’ll keep you posted as other Y&R news comes in. Stay tuned to the CBS soap and don’t forget to check CDL often for the latest Young and the Restless spoilers, updates and news. Sign up for our newsletter by clicking here and get the latest breaking soap news!